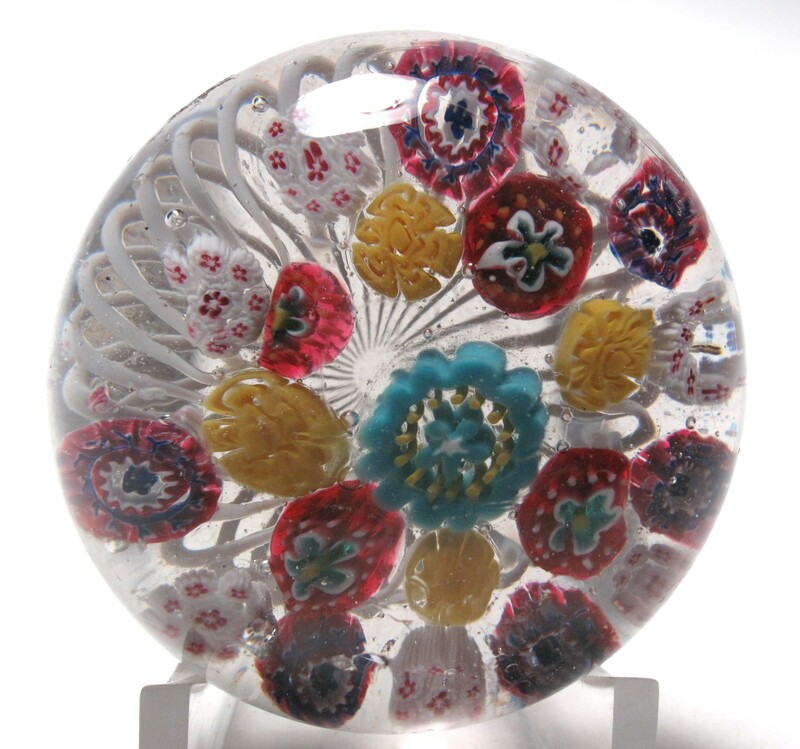 The paperweights on this page are all various Bohemian factories. 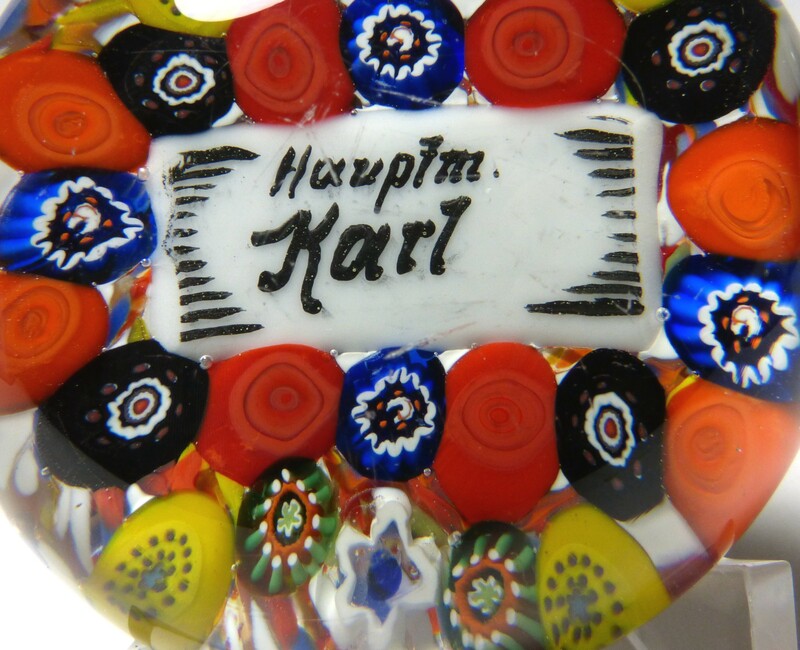 These factories were made in the glass making regions that are today in the border area between the Czech Republic and Poland. 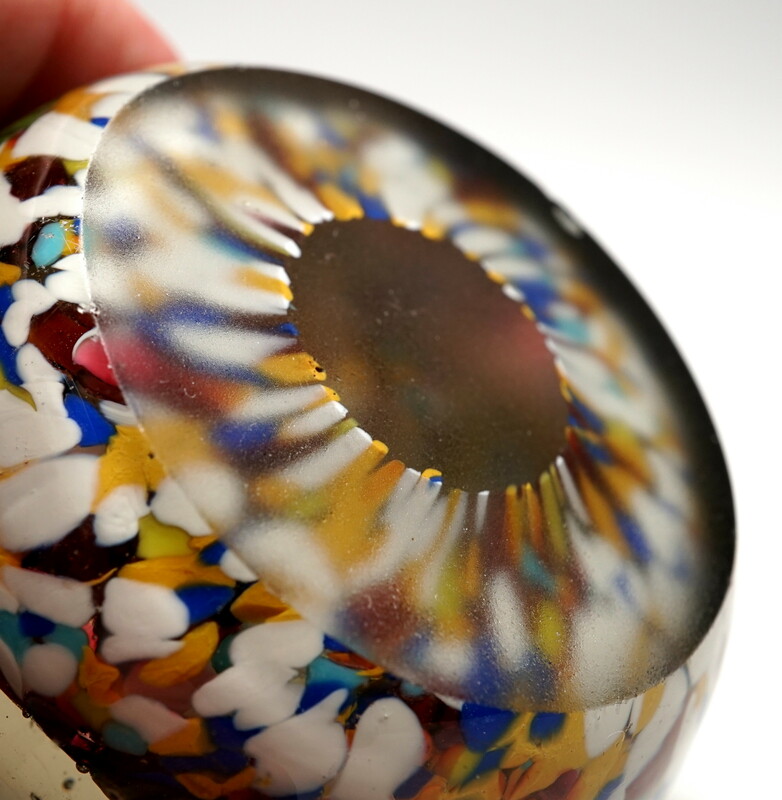 There is documentation to suggest that some of these factories engaged in the manufacture of millefiori as early as 1833. 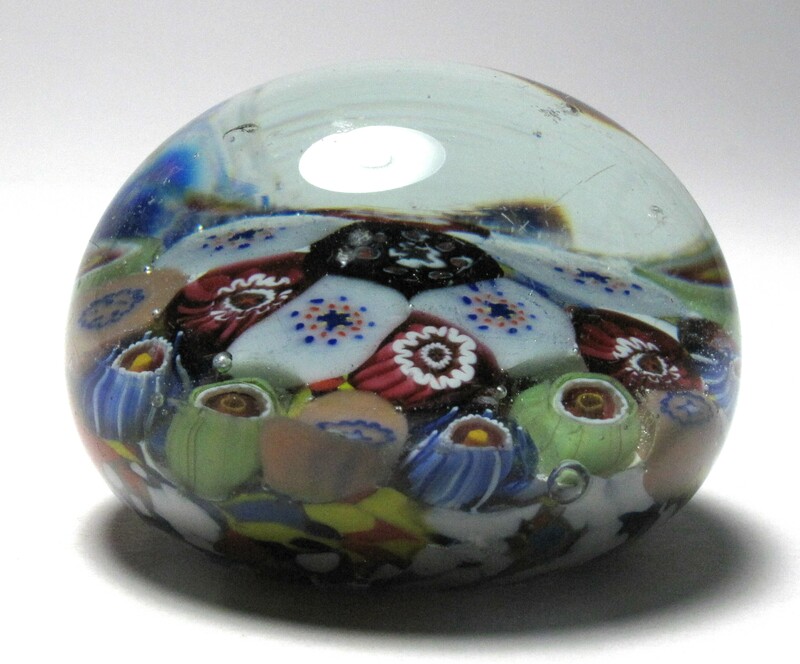 In the past, paperweight collectors identified paperweights from this region as simply Bohemian. 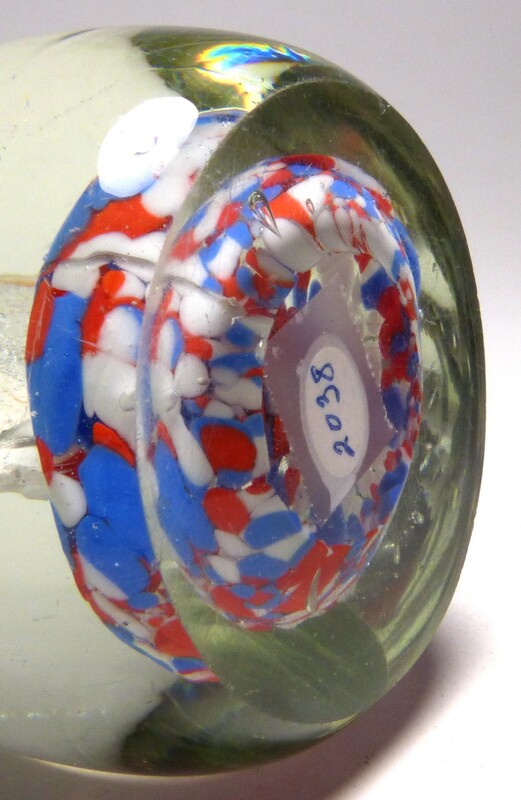 More correctly, the glassworks were located in Prussia, Austria, Poland, and the Czech Republic. 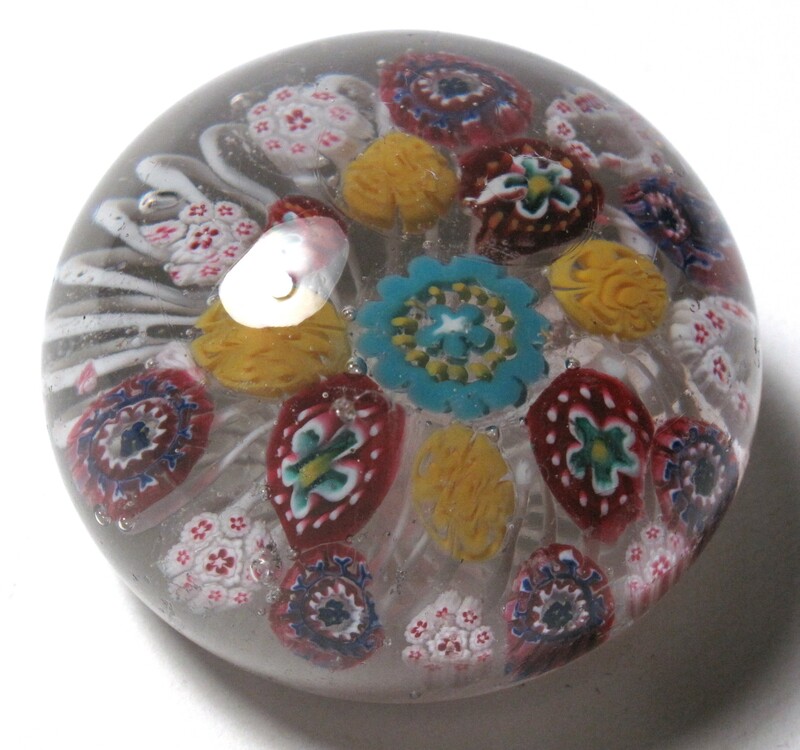 Paperweights of this type are becoming more in demand as collectors find out more about the various German and Bohemian factories. 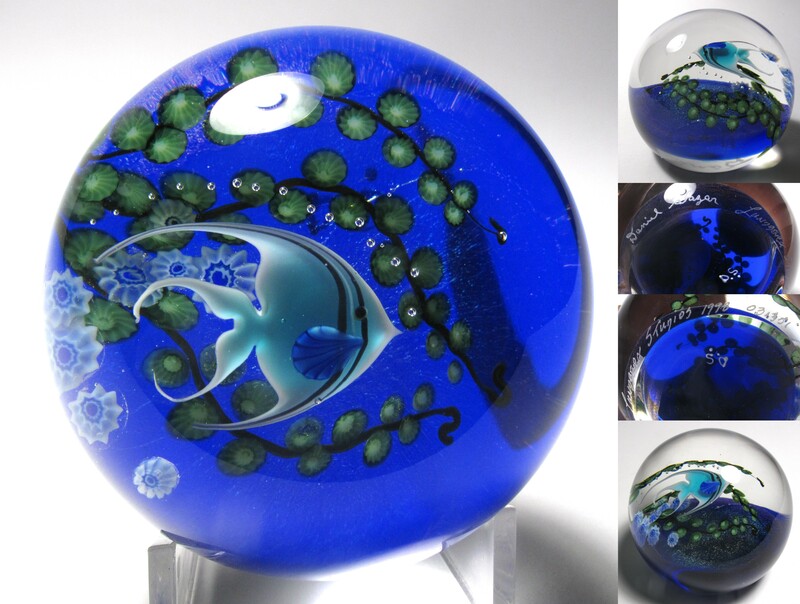 For more information, you can read about paperweights from Germany and Bohemia in the book by von Brackel Paperweights: Historicism - Art Nouveau - Art Deco - 1842 to today and in the book by Marek Kordasiewicz Glass Paperweights: The Heritage of the 19th Century Riesengebirge and Isergebirge Glassworks.For some great references on paperweights, check out my list of paperweight books for sale. 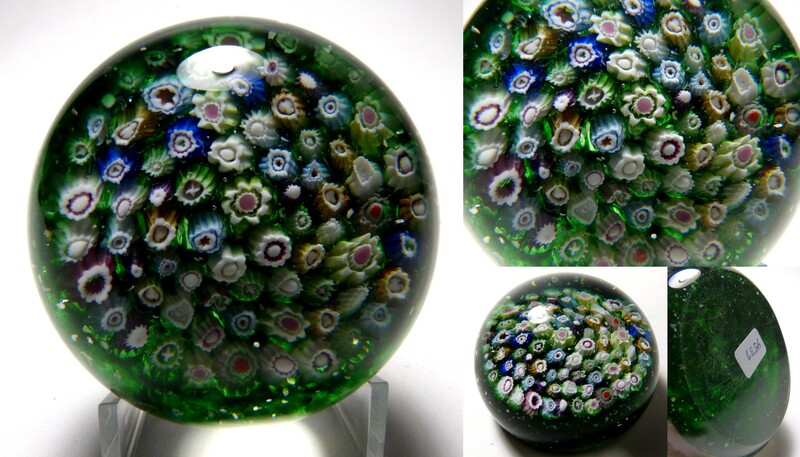 2622 Antique Medium Sized Thuringia or Silesia Bohemia Concentric Millefiori Paperweight. Circa 1870 - 1940. 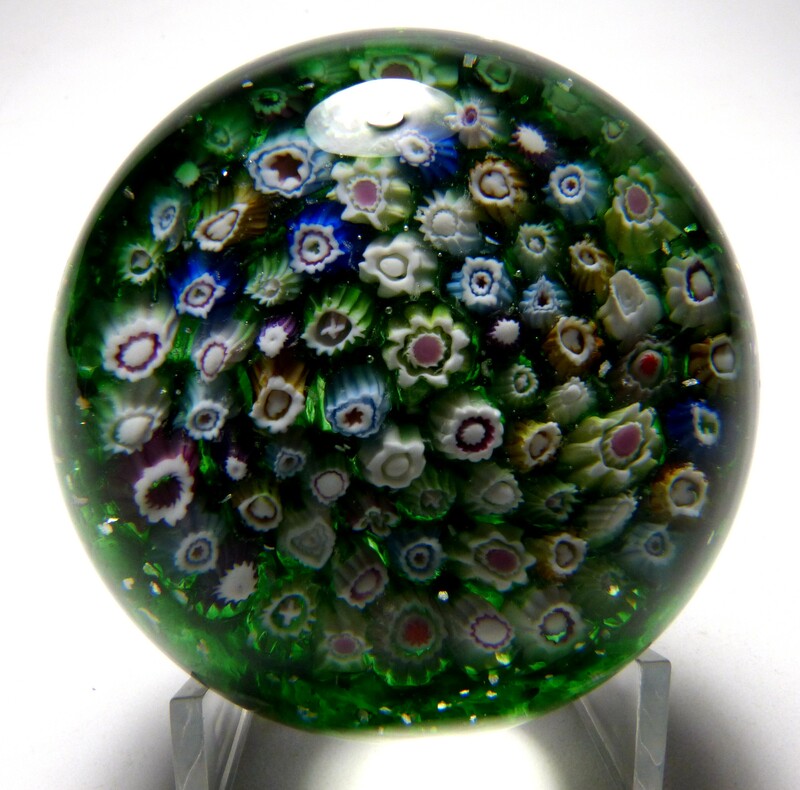 Colorful antique paperweight with colorful millefiori canes arranged in a concentric pattern over a multicolored frit ground. 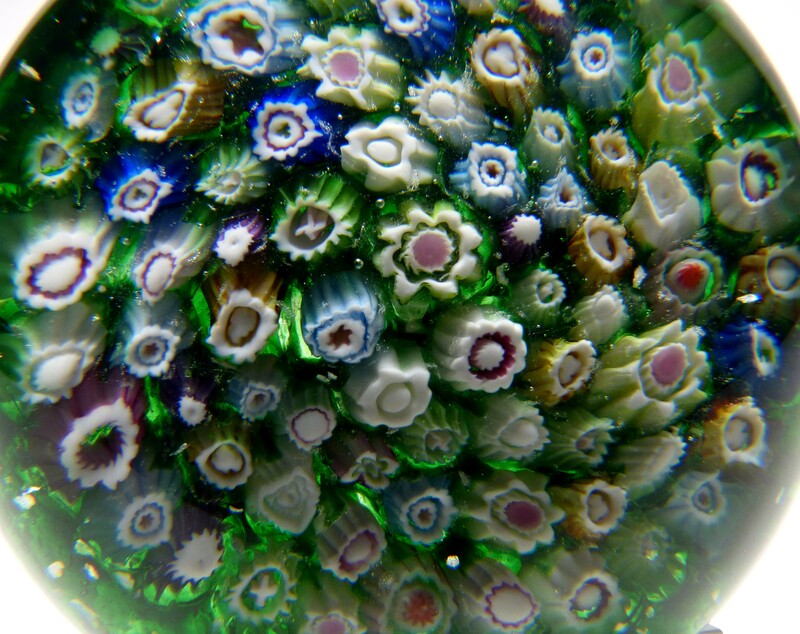 The millefiori canes are arranged in two rings around a larger central cane. They repeat in alternating patterns to make up the design with 23 canes in all. 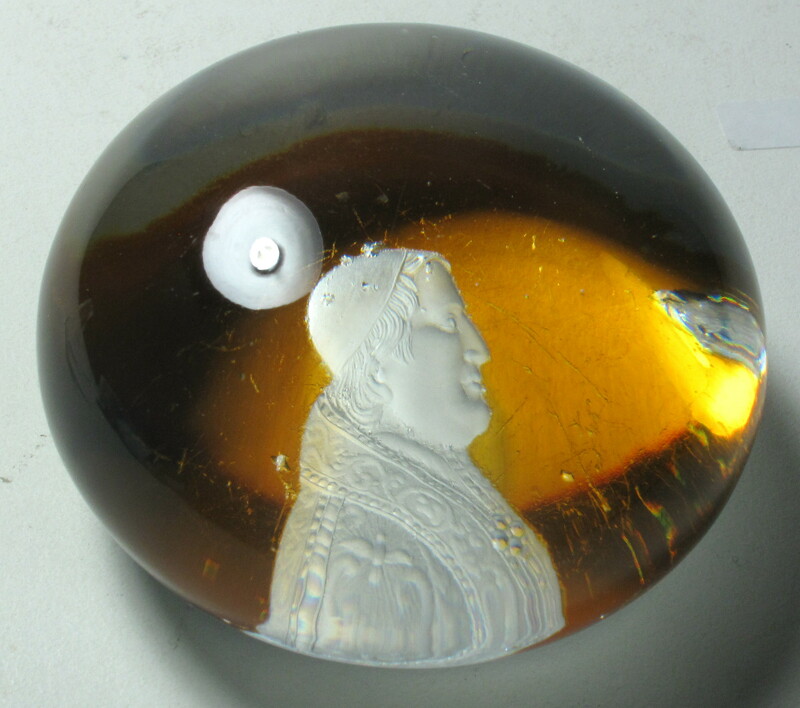 There are some wonderful complex canes in this paperweight. 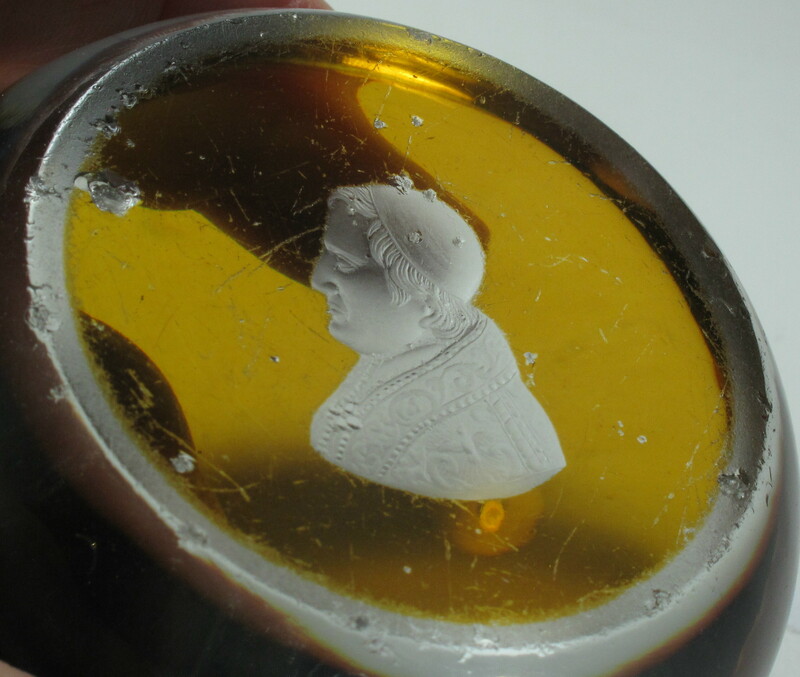 An interesting example of a type of weight that is becoming more in demand as collectors learn more about the various Bohemian factories and eastern Germany factories. The glass is grayish. This is a relatively rare item. 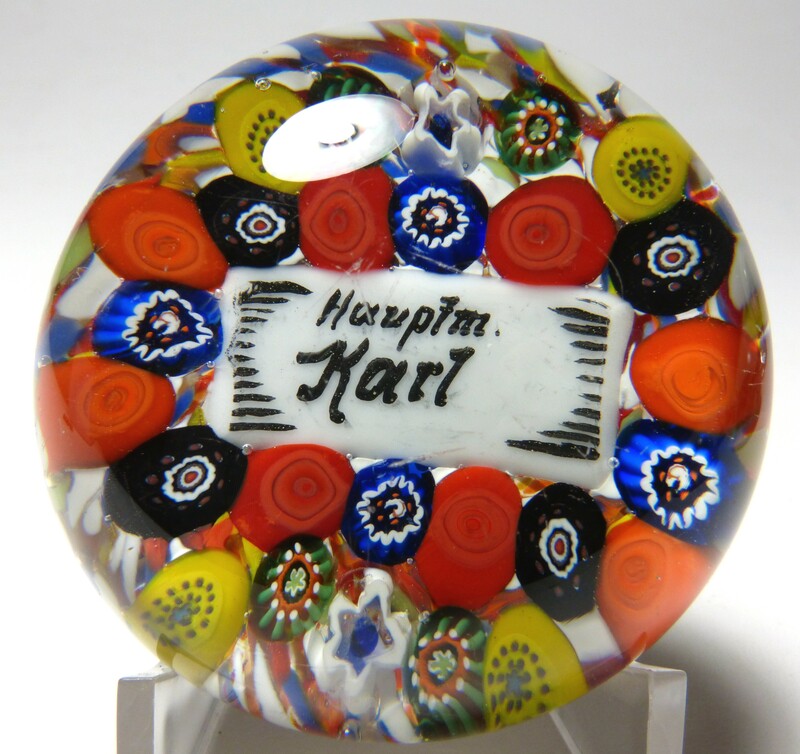 Medium Size: Just under 2 7/16" diameter by just under 1 15/16" high. The base is ground flat. The glass is grayish. 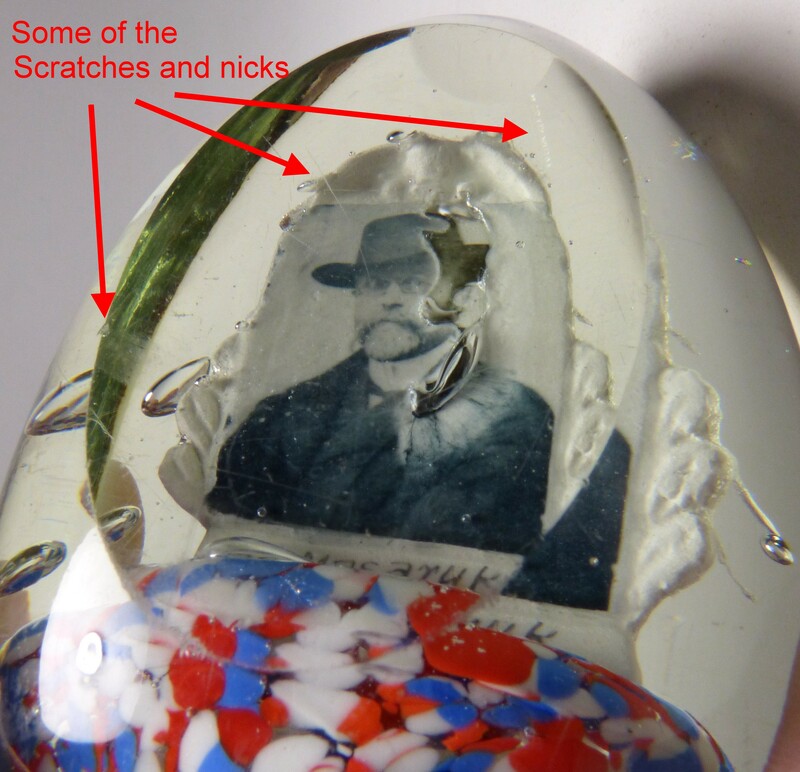 Condition: Good condition for its age, but there are quite a few scratches and tiny nicks on the surface. I did not see any circular impact marks or cracks. 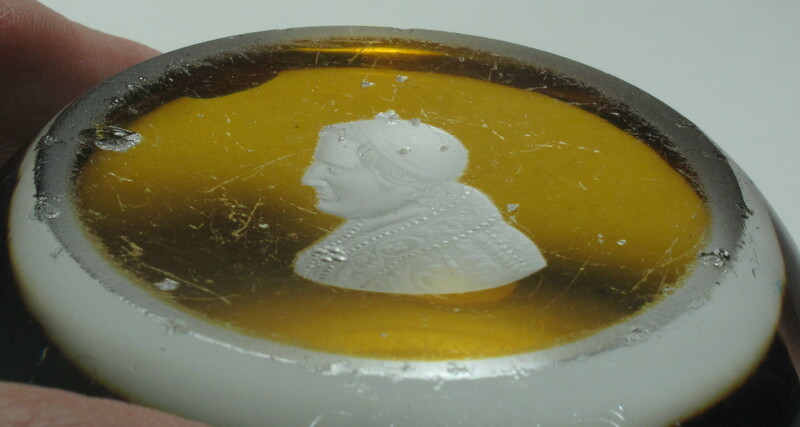 Some of the wear is shown in the side view. 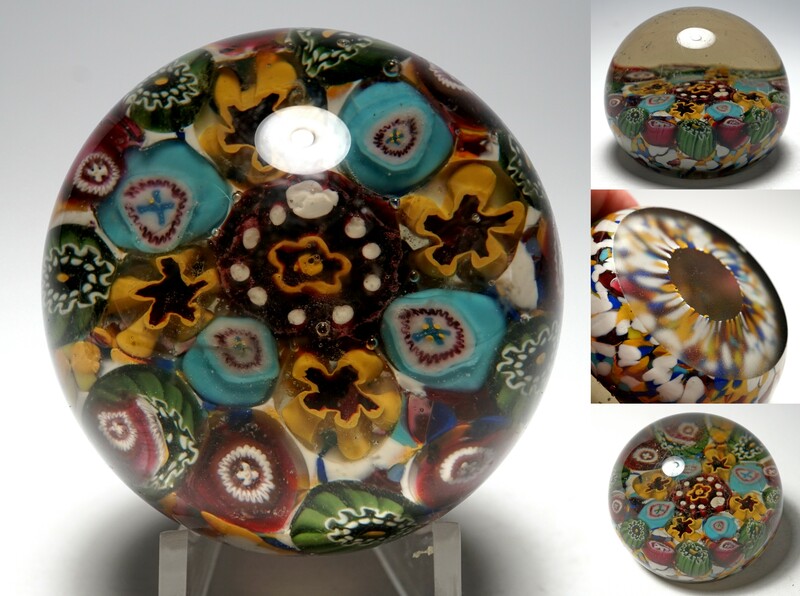 4539 Rare Antique Riedel Closepack Millefiori Paperweight on Green Mica Ground. Circa 1870-1910. 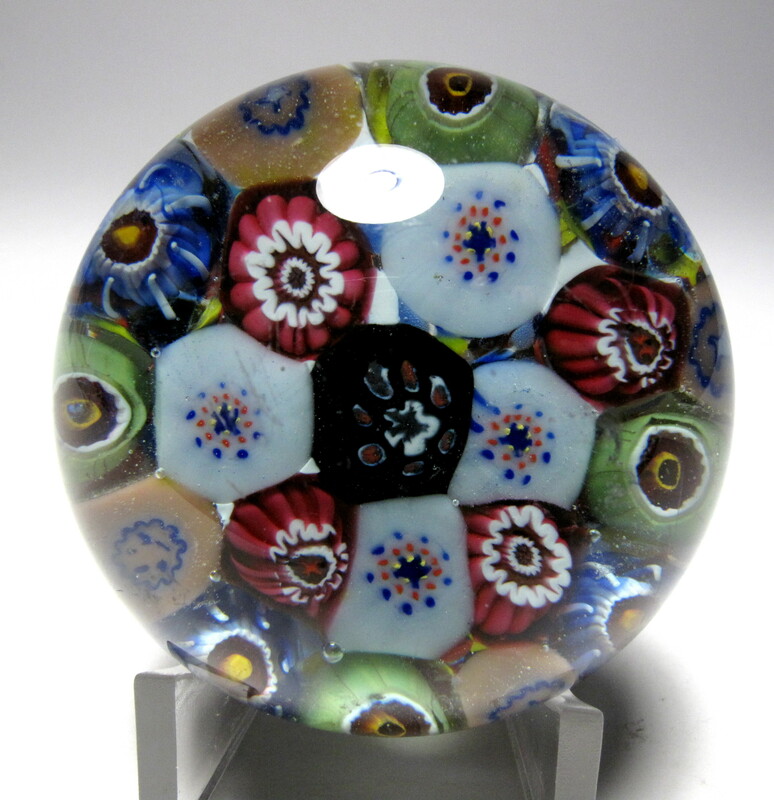 Rare closepacked millefiori paperweight from the Riedel Glassworks in Bohemia. 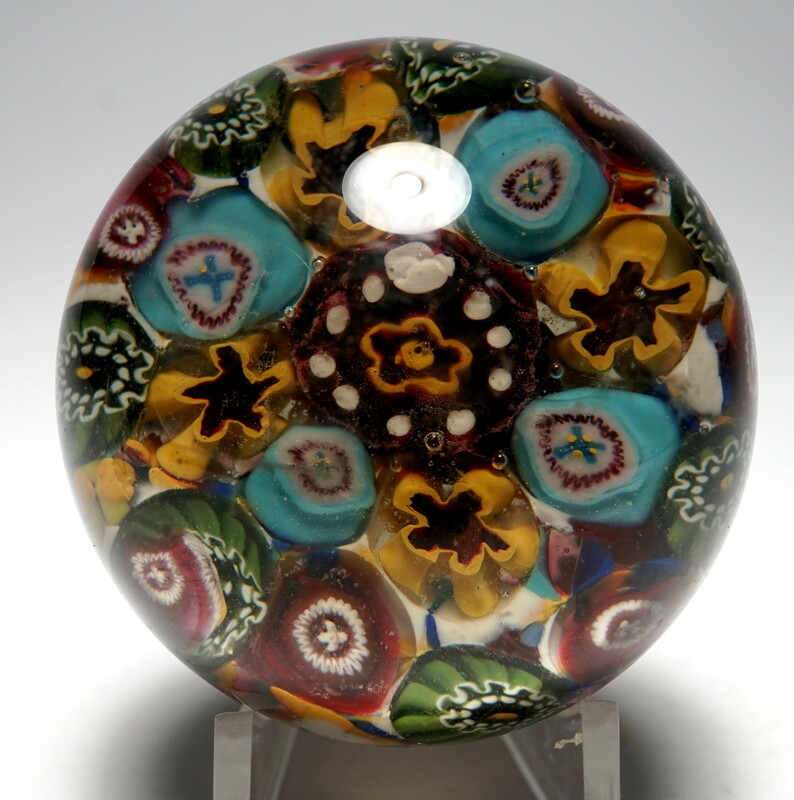 The paperweight features a variety of millefiori canes. 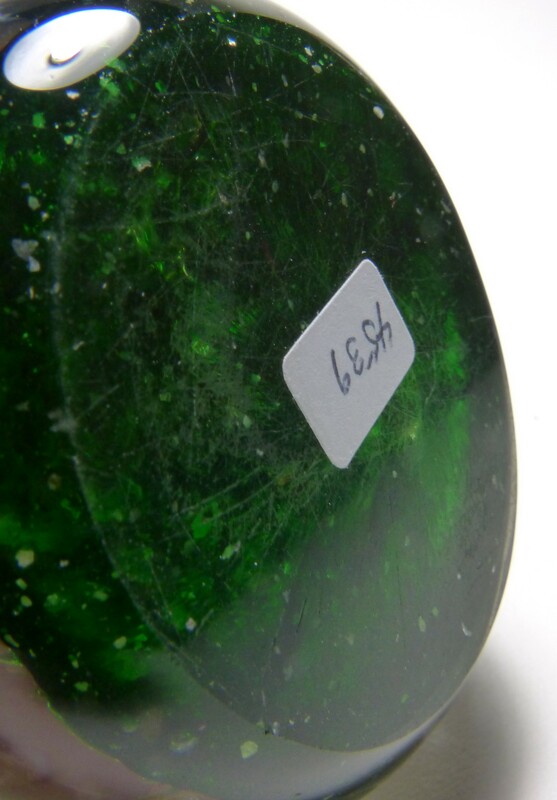 The ground is a translucent green cushion interspersed with mica flakes. 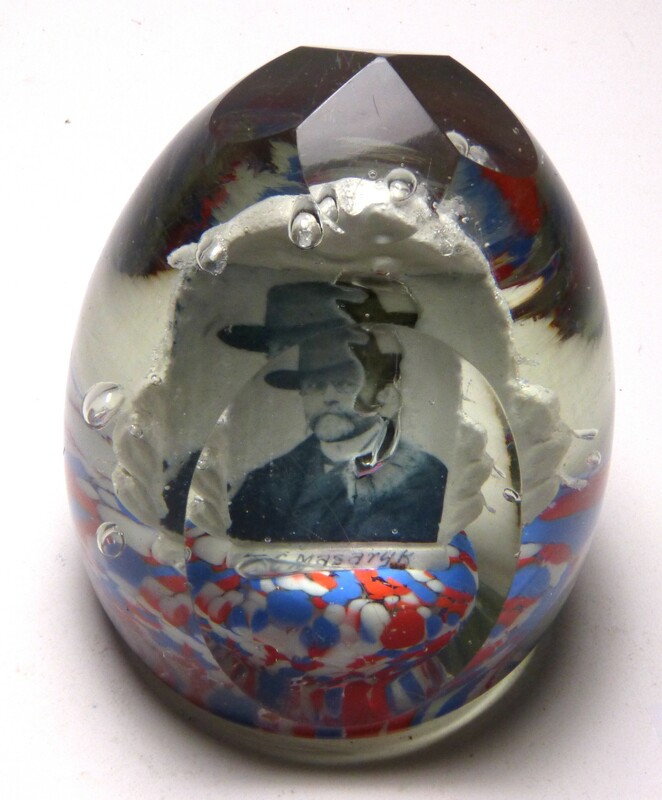 A rare paperweight that would be a great addition to any collection of antique paperweights. 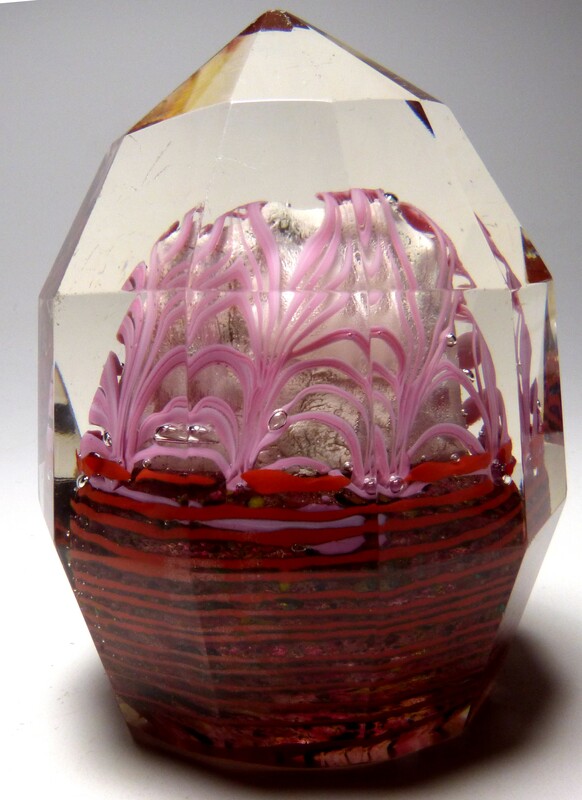 A similar, although smaller, example sold for $720 in the LH Selman Fall 2013 auction. 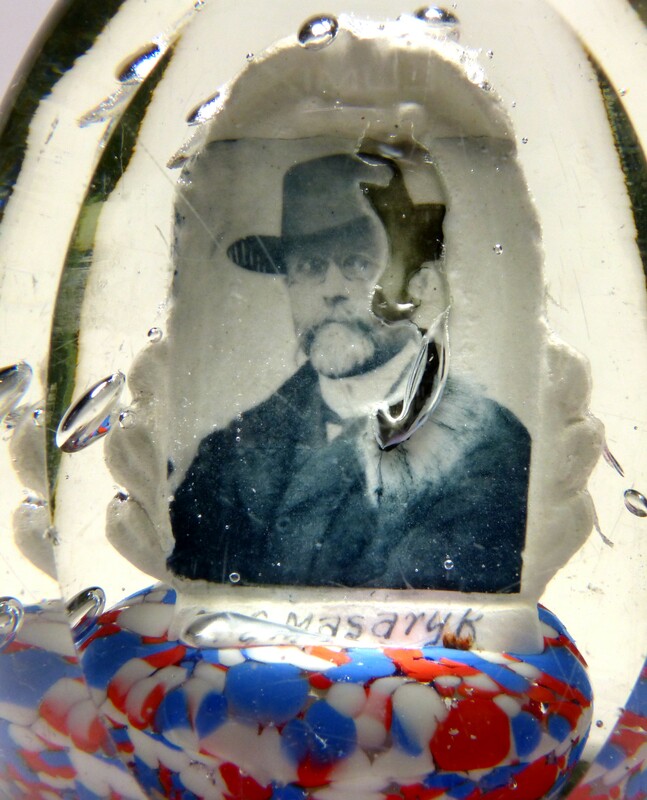 In 1756, Johann Cristoph Riedel founded a glass factory in Polaun, Bohemia (now part of the Czech Republic). 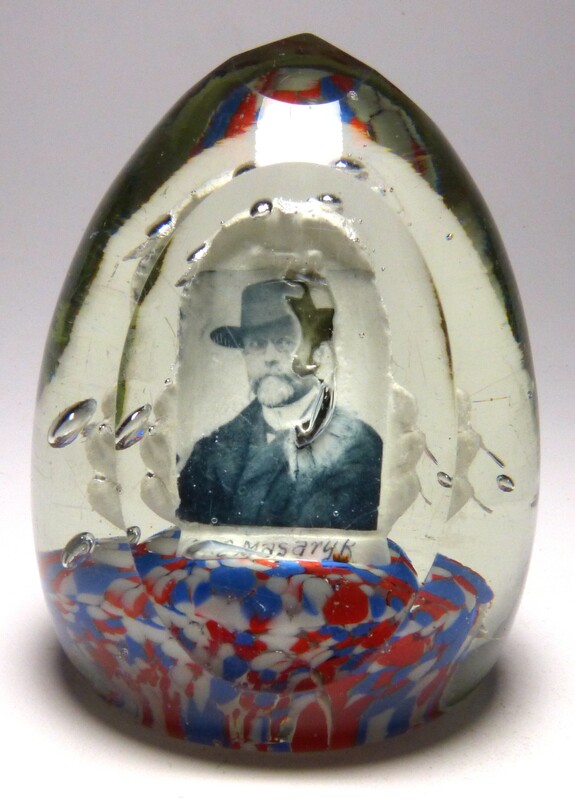 The company continued to produce a variety of glass products up to about 1940. 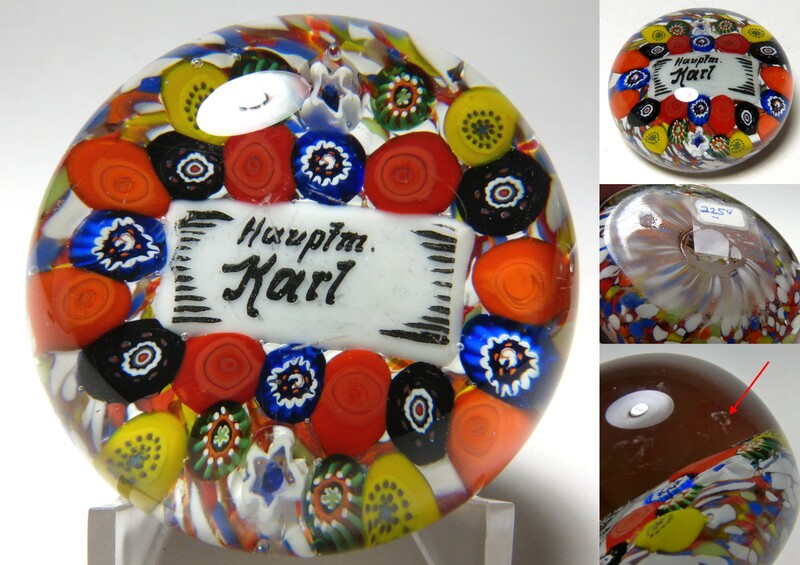 After the war, the company was reinvented in Kufstein, Austria as a maker of high quality wine glasses. 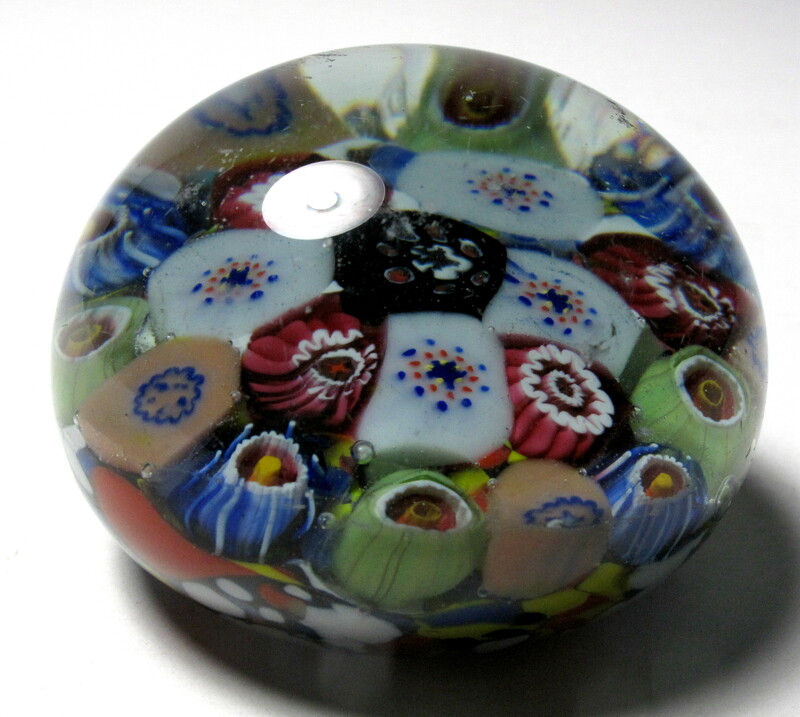 Millefiori paperweights were made at Riedel during the management of Josef Riedel, who took ownership in 1849. 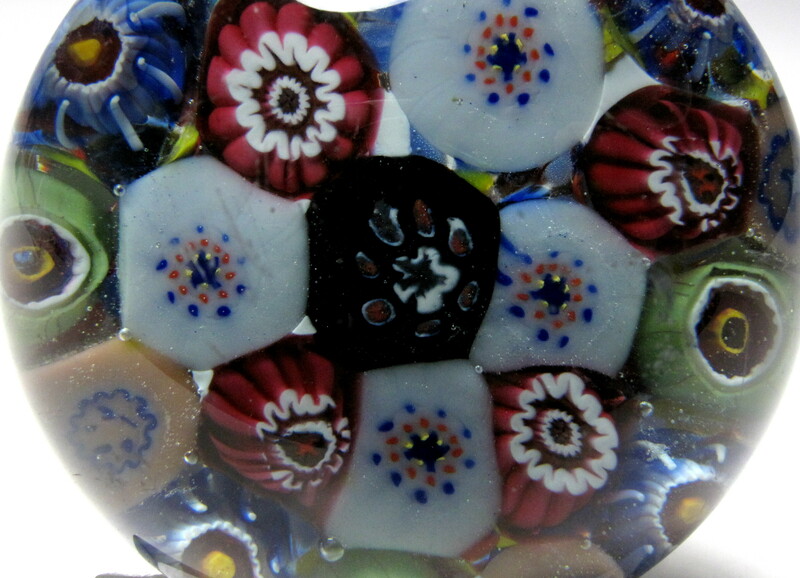 They produced a wide variety of millefiori weights including signed examples. 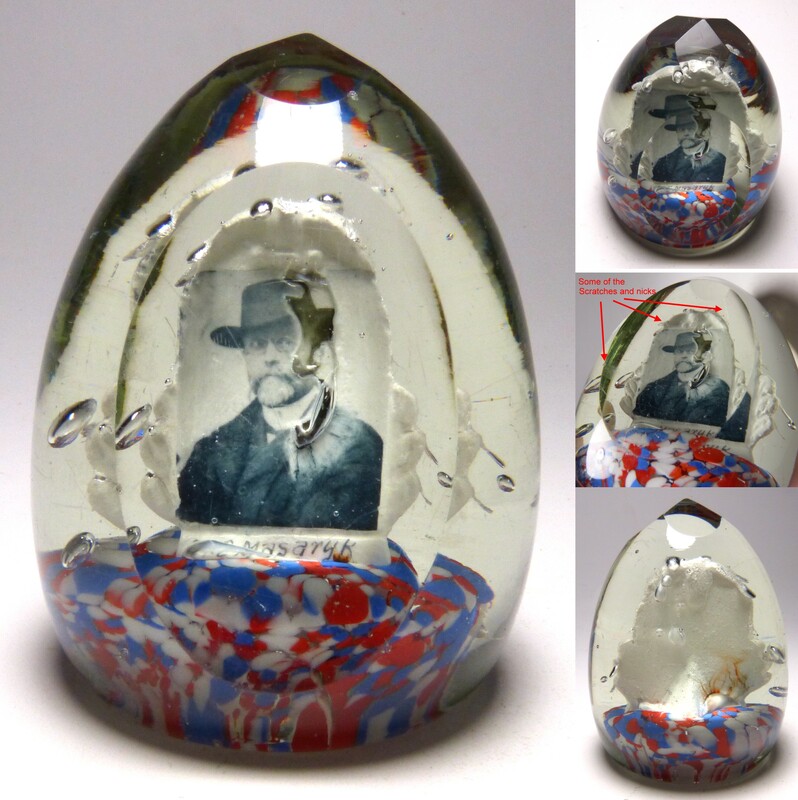 For more information on this factory, you can read the articles in the Annual Bulletin of the Paperweight Collectors Association (PCA) by Marek Kordasiewicz (2008 issue) and John Simmonds (2010 issue). 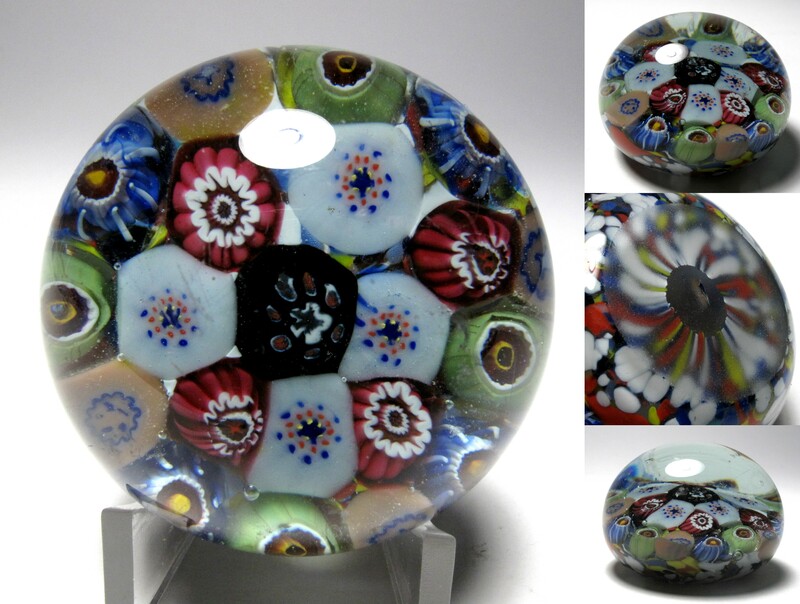 Large Size: Just over 2 3/4" diameter by 2 1/16" high. The bottom is ground flat. Condition: Very good condition. 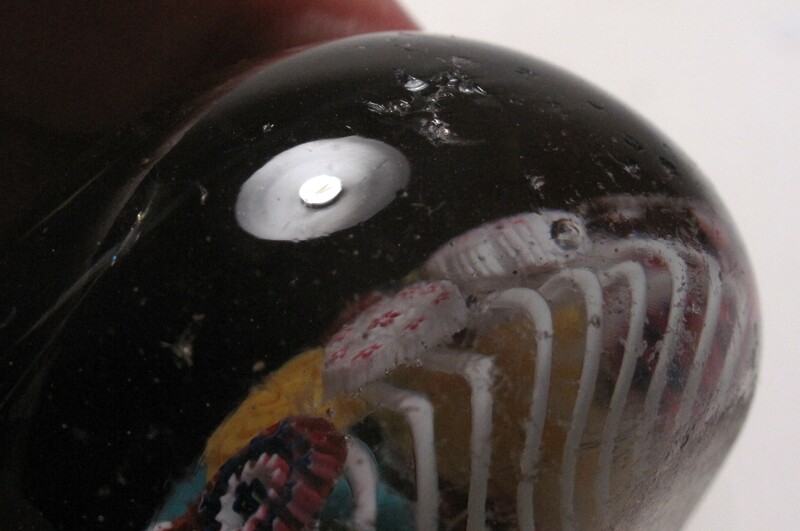 The dome is relatively problem free, but there are a few faint nicks and scratches the worst of which is 1/4" long. There is also a scuffed area about 1/4" diameter on the side. No cracks and no impact marks. The base has age appropriate wear. 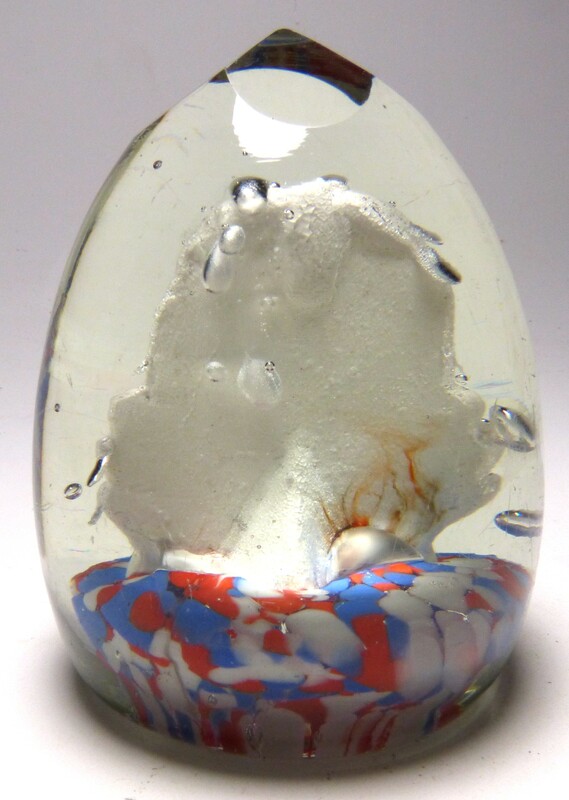 Signature : Unsigned, but I guarantee that this is an antique paperweight from the Riedel factory. 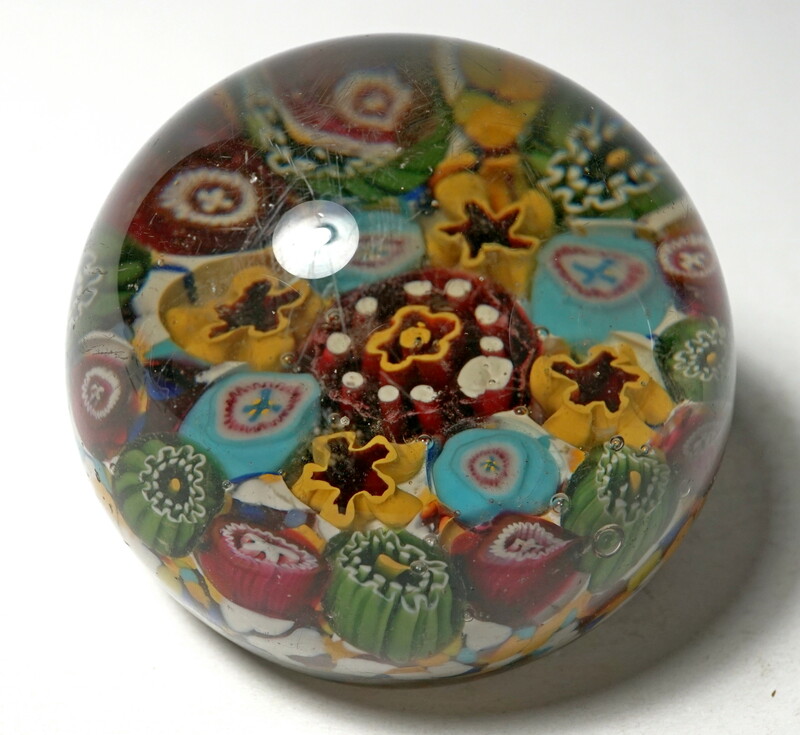 4447 Small Antique Thuringia or Silesia Bohemia Concentric Millefiori Paperweight. Circa 1870 - 1940. 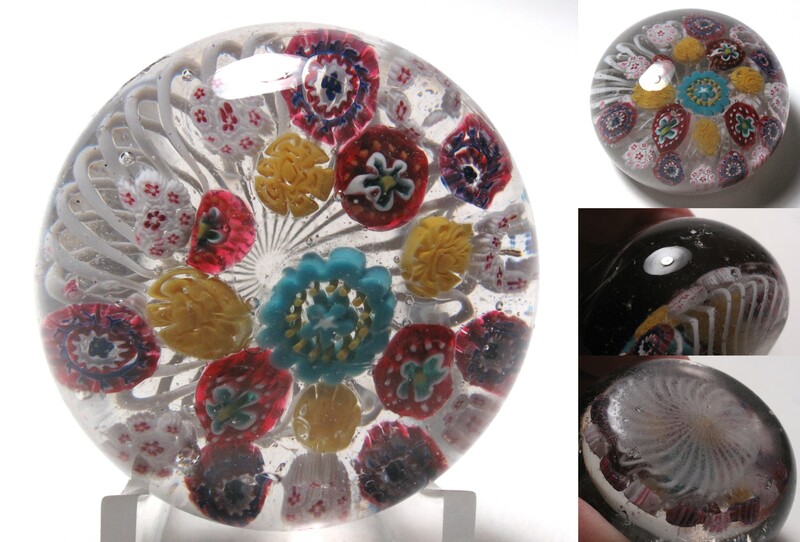 Colorful antique paperweight with colorful millefiori canes arranged in a concentric pattern over a multicolored frit ground. 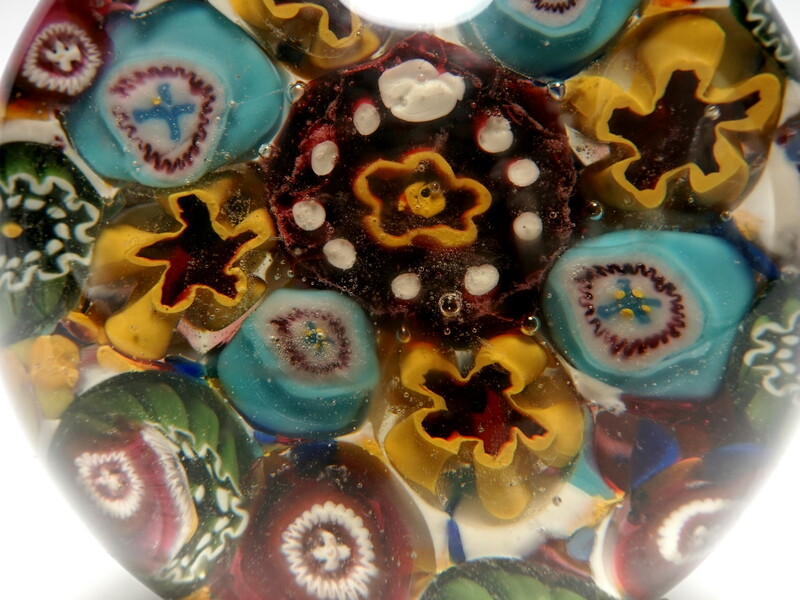 The complex millefiori canes are arranged in two rings around a central cane. They repeat in alternating patterns to make up the design with 21 canes in all. 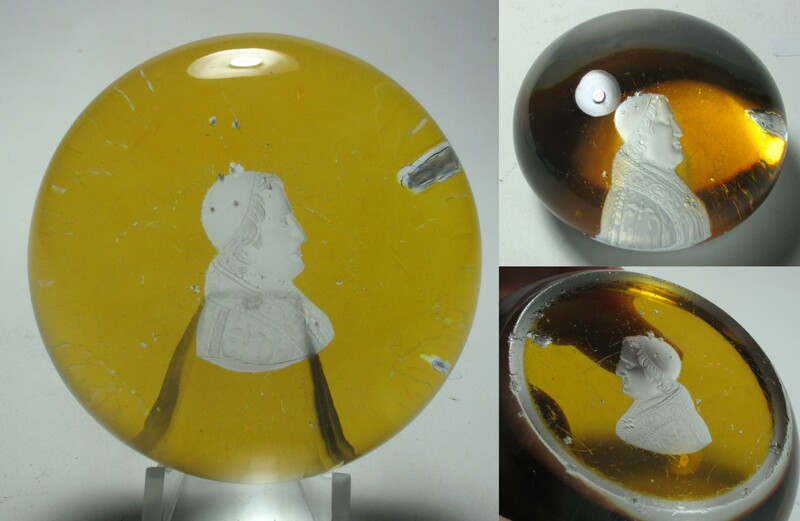 There are some wonderful complex canes in this paperweight. 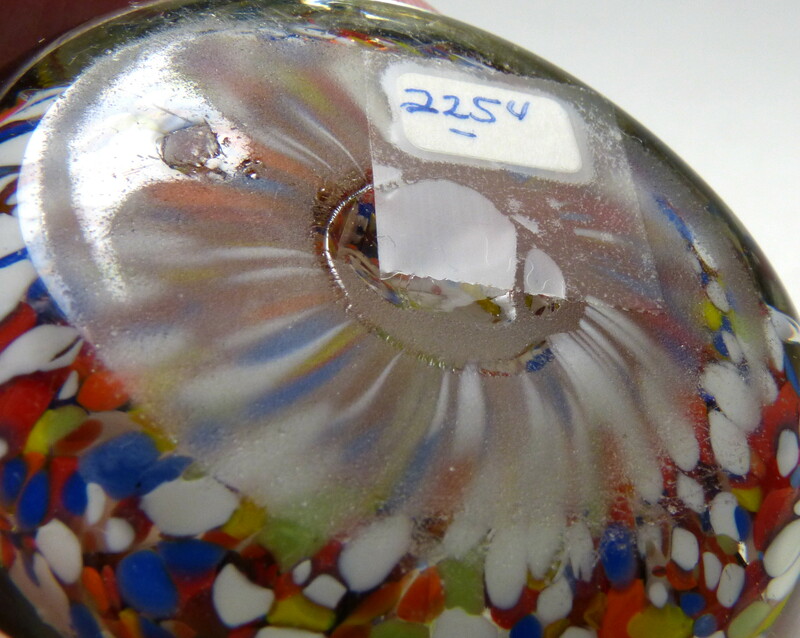 An interesting example of a type of weight that is becoming more in demand as collectors learn more about the various Bohemian factories and eastern Germany factories. The glass is grayish. This is a relatively rare item. 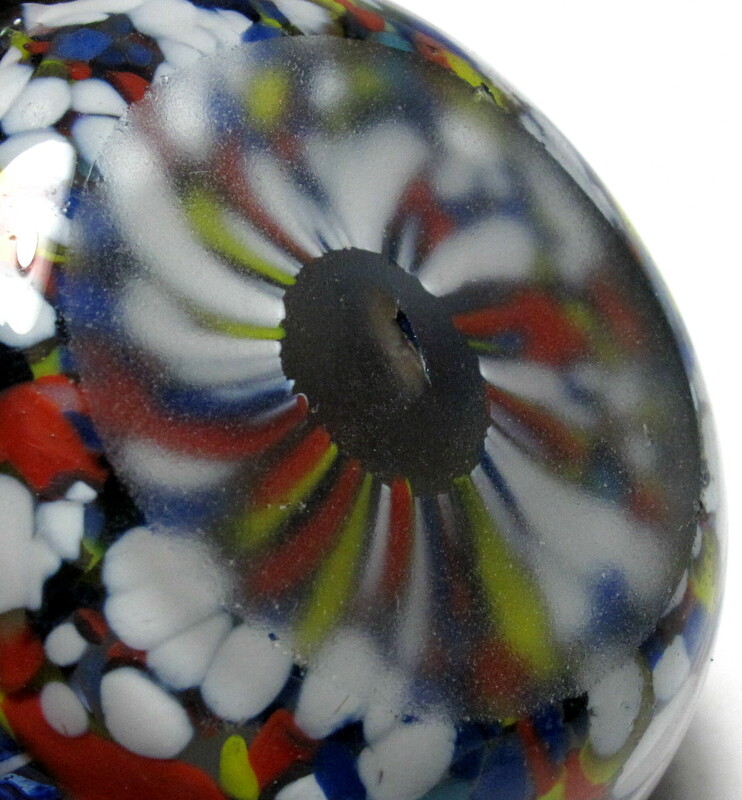 Small Size: 2 1/16" diameter by 1 7/16" high. The base is ground flat with a matte finish. 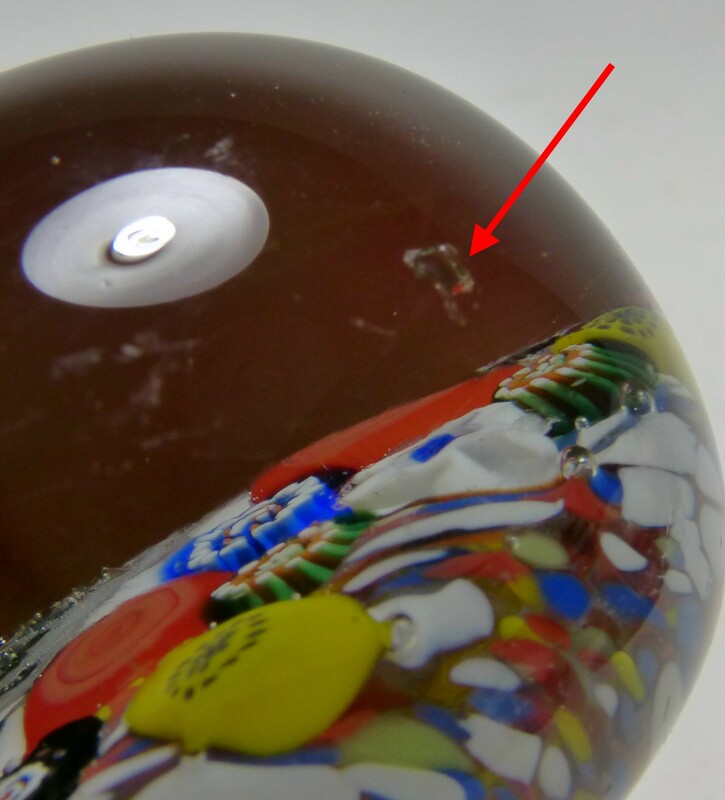 There is a small crack remaining from the pontil mark in the center. The glass is grayish. Condition: Good condition for its age. There are some scratches and tiny nicks on the surface and at least two faint circular impact marks. Some of the damage is shown in the side view. 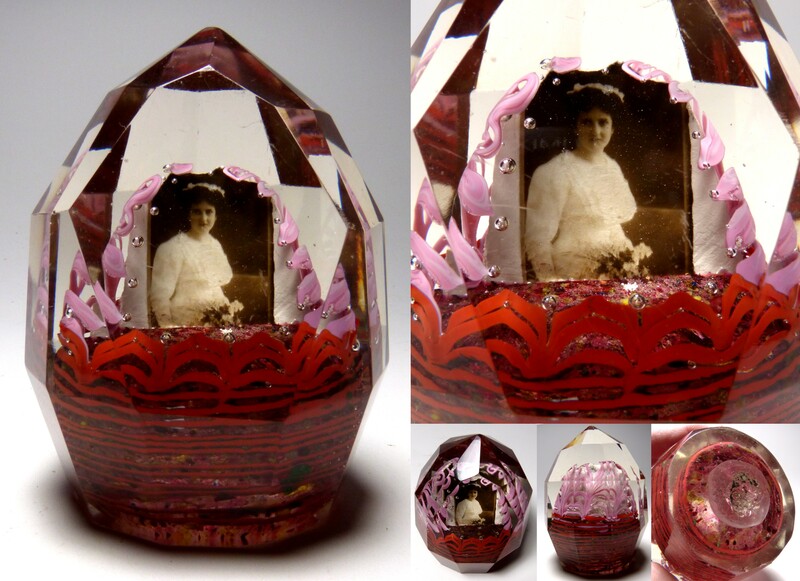 3860 Large Antique Czech / Bohemian Faceted Bride's Picture Paperweight. c.1900-1930. 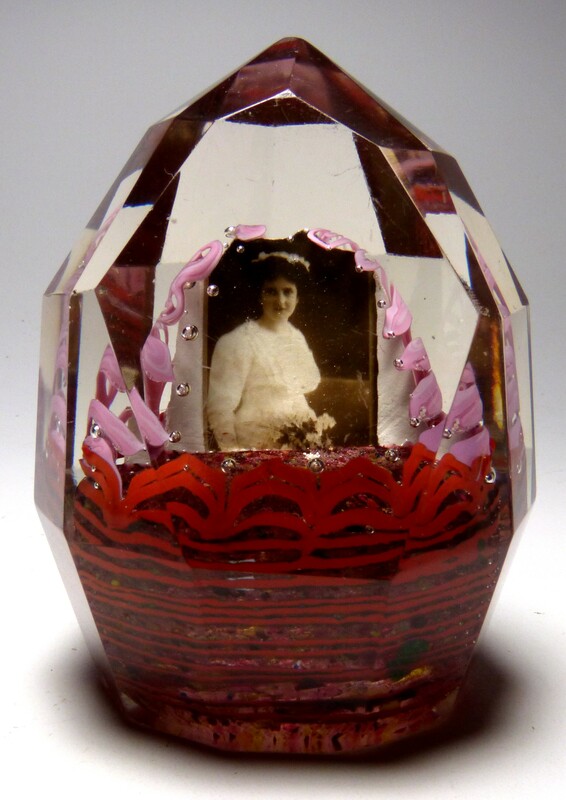 Large faceted paperweight with a bride's picture surrounded by pink loops and a ring of carefully placed bubbles. The bride is wearing a white wedding dress and holding a bouquet of flowers. 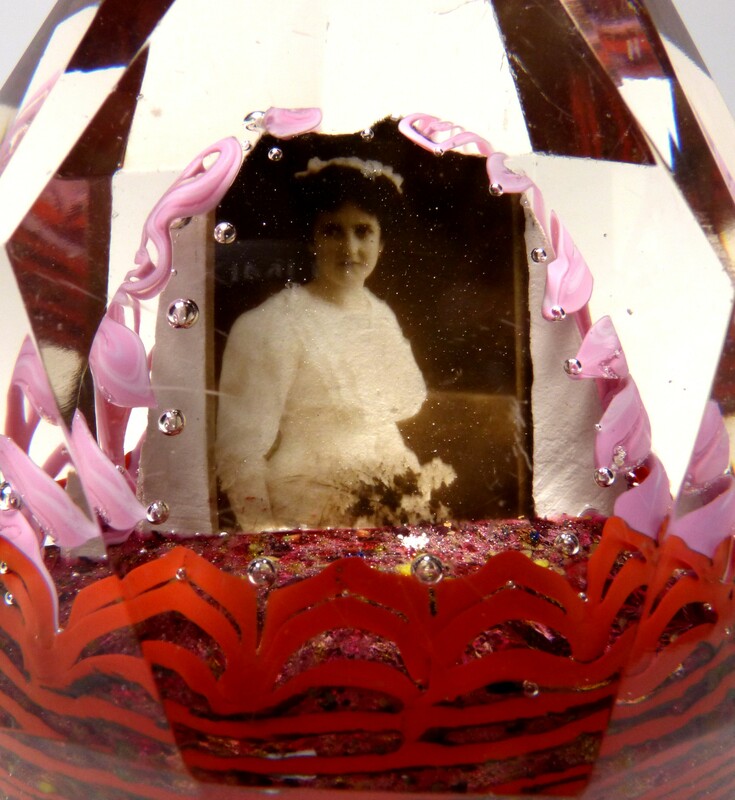 The picture is placed on a sulphide frame that rests on a mostly red multi-colored cushion of glass bits. 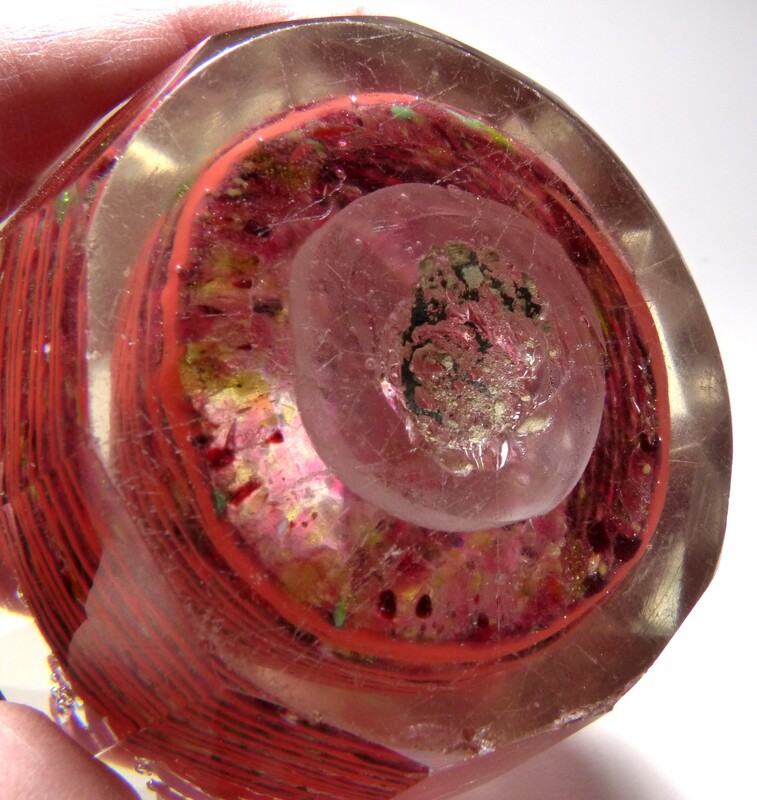 There layers of red rings and loops surrounding the base wrapping around to the back. 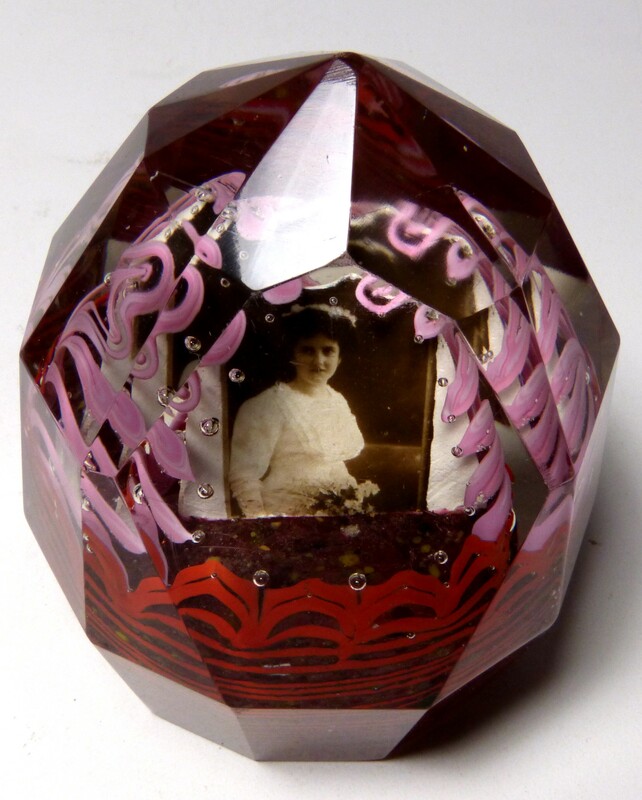 The paperweight has a complex faceting with one large "picture window" plus 40 other facets. 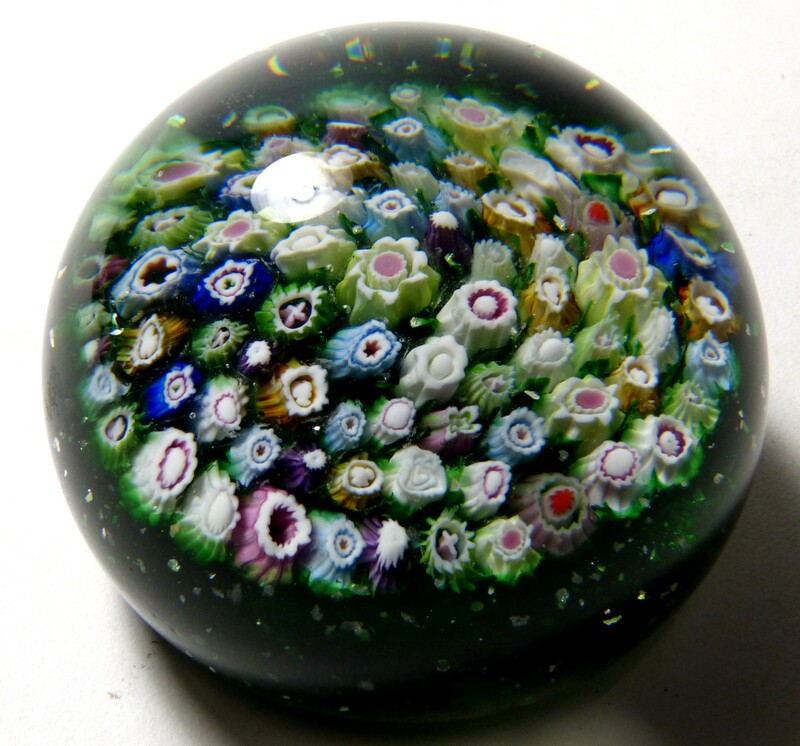 An unusually complex design for a paperweight of this type. 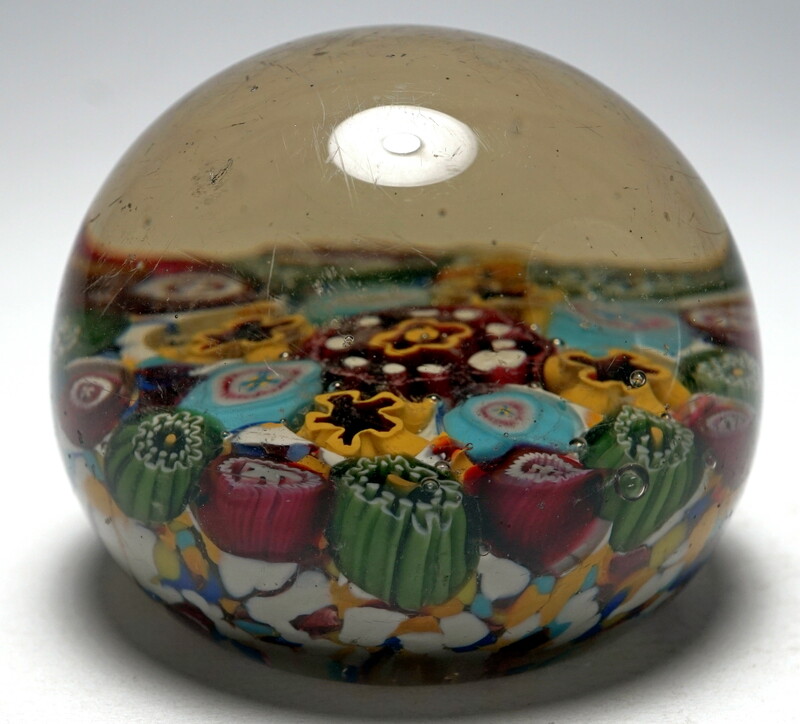 The paperweight was made in Northern Bohemia during the period 1900 to 1930. 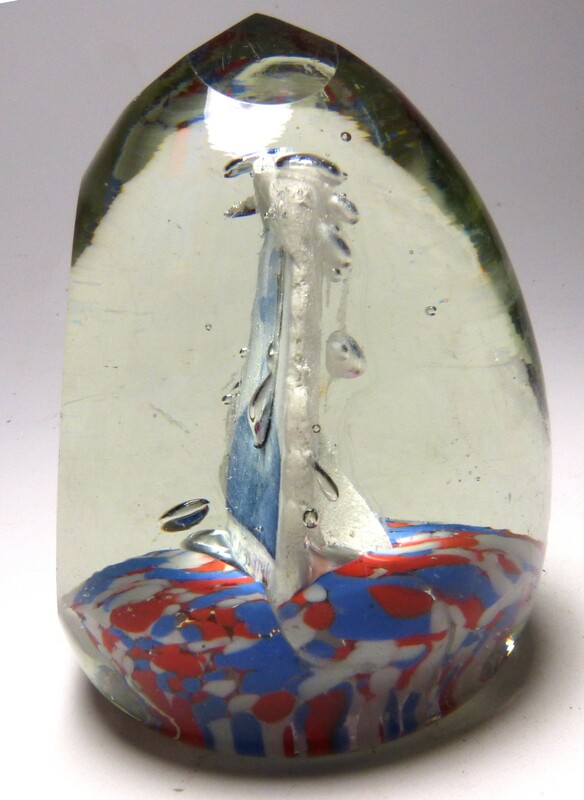 The glass is heavy crystal and weights 28 ounces. 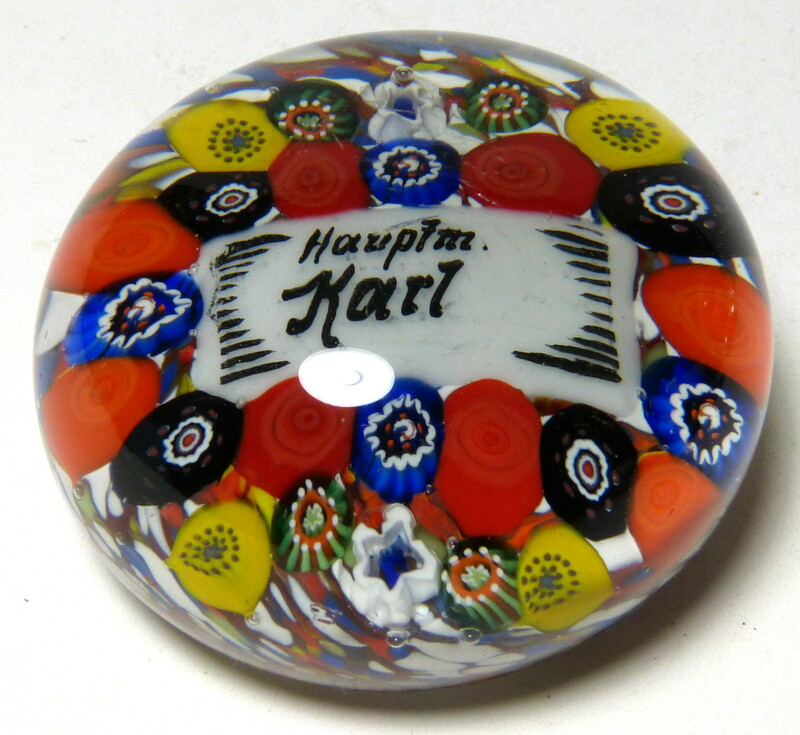 Von Brackel discusses this style in his book Paperweights - Historicism - Art Nouveau - Art Deco. He discusses several examples on pages 102 to 195 with a range of values up to $480. 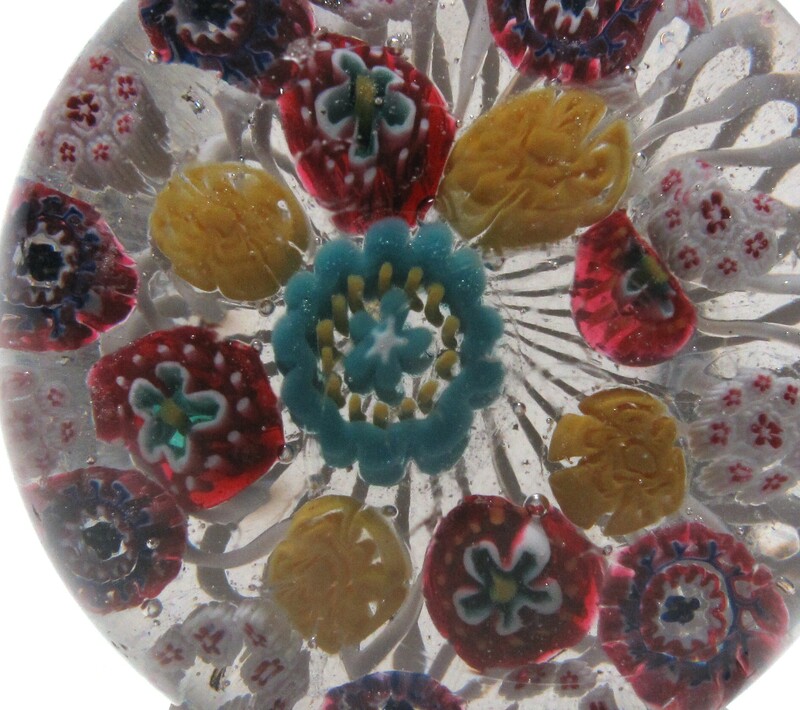 Large Size: Just over 3" diameter by 4" high. The bottom is ground flat with a pontil scar in the center. Condition: Good to very good condition for its age. 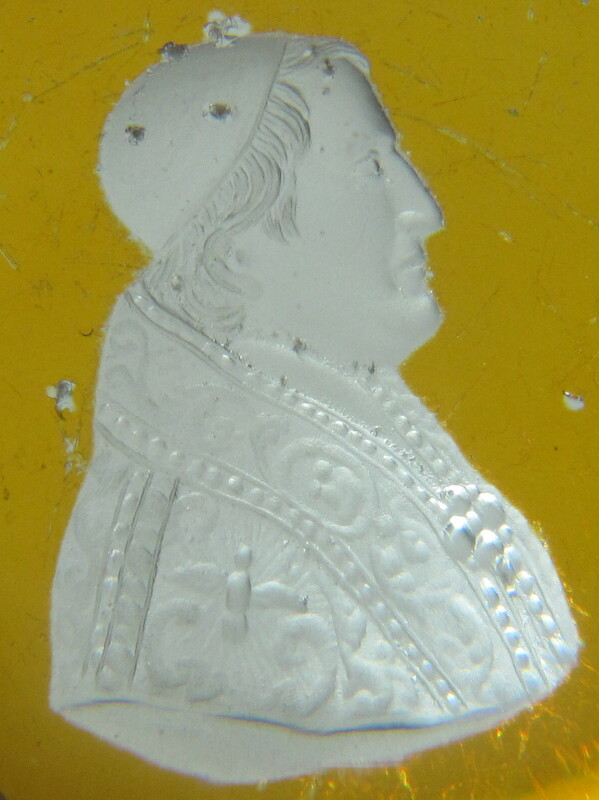 There are scratches on some of the facets (including the large window facet) and some chips where the base meets the sides. The base shows considerable wear and there is rough pontil scar in the center. 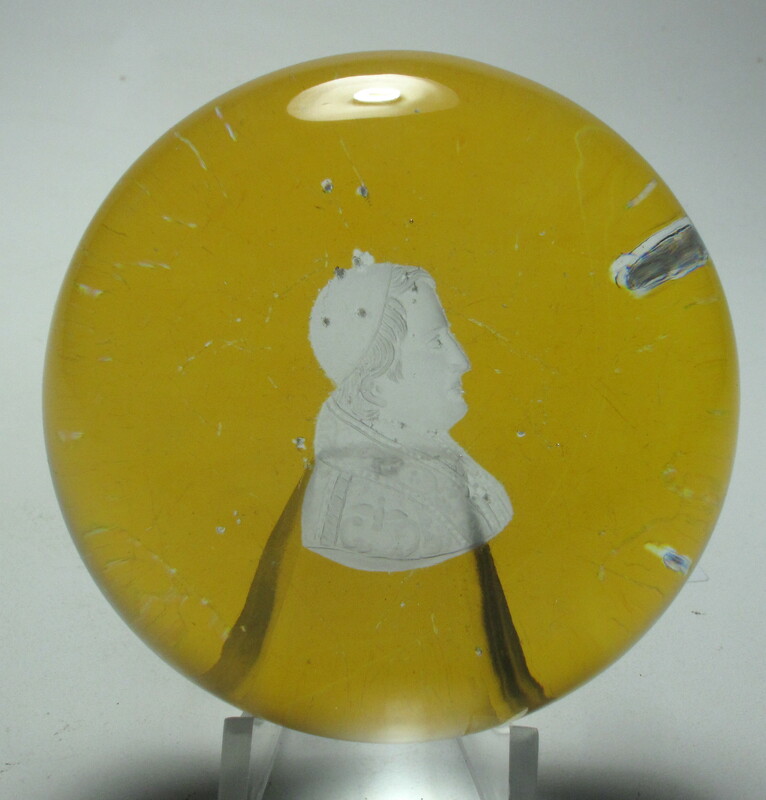 The the paperweight displays very well. 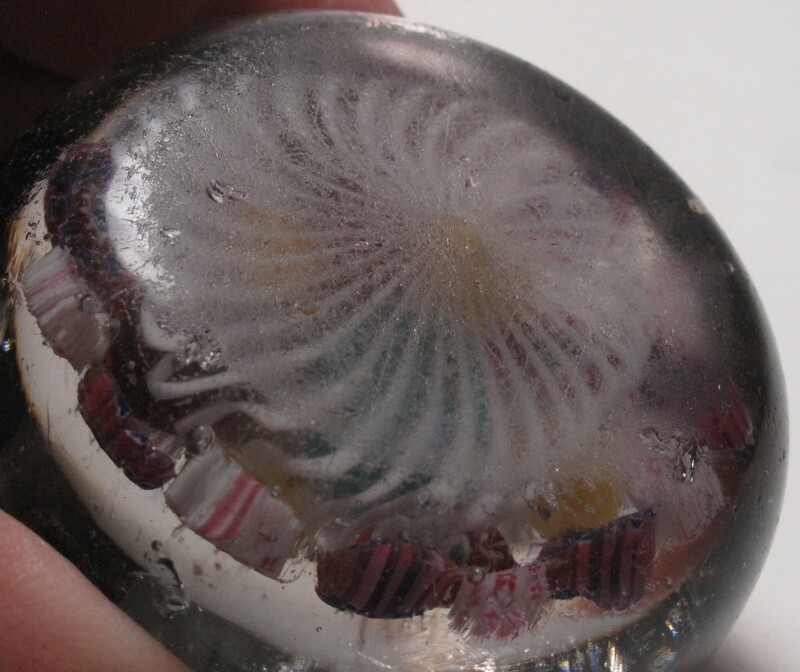 Signature: Unsigned, by I guarantee that this is a vintage paperweight from the Bohemia / Czech region and it originates from approximately 1900-1930.